For those betting on the Kentucky Derby in 2014, it’s still not clear if John Velazquez will have his choice among two of Todd Pletcher’s top Kentucky Derby contenders in Commissioner and Havana for May’s Run for the Roses. 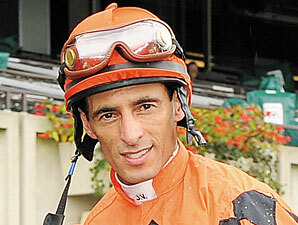 Velazquez was born November 24, 1971, in Puerto Rico and entered jockey school in 1988. He moved to New York under the guidance of retired Hall Fame jockey Angel Cordero Jr, who later became his agent, in 1990 and got his first stakes win that year in the Ticonderoga at Aqueduct aboard Proud n’ Appeal. It took until 1995 for Velazquez to get his first grade 1 win, riding Turk Passer to victory at the Turf Classic Invitational at Belmont Park. Velazquez dominated at the New York tracks starting in the late 1990s and from 2001-04 led the national standings in wins for jockeys. In 2004 he also was named the Eclipse Award winner as the top jockey in North America. He led all jockeys in earnings and rode Ashado to victory in the Breeders’ Cup Distaff and Speightstown to a win in the Sprint. Velazquez repeated as the top money-winner and Eclipse Award winner the next year. It took until 2007 for Velazquez to win his first Triple Crown race. Filly Rags to Riches outdueled Preakness winner and future Hall of Famer Curlin in the stretch run to win the Belmont Stakes by a head. She became the first female since 1905 to win the Belmont. It ended a 0-for-28 drought in Triple Crown races for Pletcher and 0-for-27 for Velazquez, who got to ride Rags to Riches because her regular rider Garrett Gomez had committed to another horse. In 2011, Velazquez got his lone Kentucky Derby win, but it was for trainer Graham Motion. Uncle Mo, the 2-year-old champion, was the heavy favorite on Kentucky Derby odds but was forced to withdraw on the day before the race. That was to be Velazquez’s mount, but he instead found himself at the last minute on Animal Kingdom. That horse was to be ridden by Robby Albarado, but he broke his nose while being thrown off a horse three days before. Animal Kingdom would beat Nehro by 2 3/4 lengths to become the first champion to make his dirt debut in the Derby. Animal Kingdom paid $43.80 to win at 20-1 on Kentucky Derby odds. In 2012, Velazquez was inducted into the Racing Hall of Fame. Last year was a good-news, bad-news campaign for Velazquez. He did become North America’s all-time leading rider in purse money won with more than $298 million. In July, he won his 5,000th career race, and in August he became the all-time winningest rider at Saratoga. However, he was on Kentucky Derby betting favorite Verrazano, and the horse finished a disappointing 14th in the race. In addition, Velazquez suffered a serious injury in the November 2 Breeders’ Cup Juvenile Fillies when his horse Secret Compass broke down. Velazquez would need to have his spleen removed and returned to racing in early February 2014. Velazquez was aboard promising Havana last August for the 2-year-old’s maiden race at Saratoga. Havana won at 5 1/2 furlongs in 1:02.64, barely missing the track record. Havana then won the Grade 1 Champagne Stakes at Belmont, but Velazquez wasn’t available and the horse was ridden by Irad Ortiz Jr. Havana’s next start was the Breeders’ Cup Juvenile but that was run after Velazquez was injured that day. Gary Stevens rode Havana, but he already has one of the Kentucky Derby contenders in Candy Boy. Thus it could be Commissioner who Velazquez may ride in May. Commissioner has two wins in three starts and was to make his stakes debut in the February 22 Fountain of Youth, with Velazquez up.